Geoffrey Whyatt from the Sydney Observatory says it was probably a satellite, space junk or a rocket. “It had a distinct bright centre, much like a bright star … (with) trails spiraling and fattening out from it,” Canberra resident James Butcher told broadcaster ABC of the spectacle, which he said lasted two or three minutes. Other witnesses likened the spectacular phenomenon, footage of which was quick to hit the Internet, to a “huge revolving moon” with a swirl in the middle, or an illuminated cloud moving high and fast above the horizon. “It certainly had that lollipop-type swirl … but it was travelling low and fairly fast, and as it went past me and I looked up, it looked like a row of lights, maybe four lights,” one Brisbane resident said. 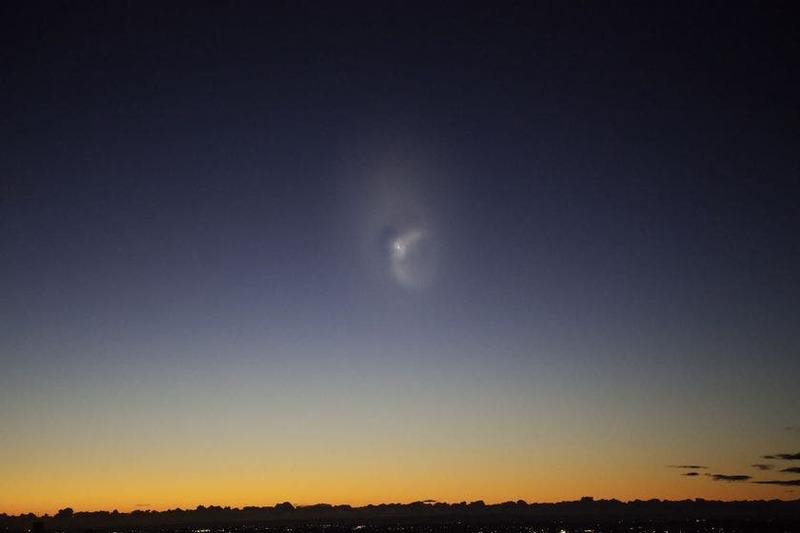 Astronomer Andrew Jacob, acting curator of the Sydney Observatory, said it was most likely SpaceX’s Falcon 9 rocket, launched Friday from Cape Canaveral shortly before dawn broke over Australia. “It fits best, a rocket travelling overhead with something venting out of it, fuel venting out of the motor,” Jacob told AFP. The light was traveling the wrong way for it to be an astronomical phenomenon, and Jacob said he had ruled out other possibilities such as comets, a spotlight on cloud or reflection of the moon, or a meteor shower. He said the timing was right for the SpaceX rocket to have traveled over the Atlantic Ocean, Africa and the Indian Ocean and be in skies over Australia at the time the spiraling light was seen. The fact that it could be seen over such a broad area meant whatever caused the flare had to be very high in the atmosphere or in orbit above the Earth, Jacob added. “All the information points to this SpaceX rocket,” he said. The launch of the privately owned Falcon 9 test rocket marked a milestone for the space industry in the race to develop commercial carriers capable of ferrying cargo and astronauts to the orbiting International Space Station.